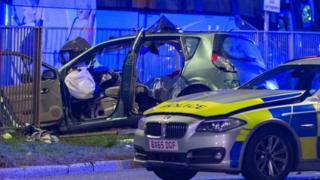 The crash happened about 20 minutes after the police pursuit began in Harrow. “It wasn’t like a normal car accident,” eyewitness Antoine Eid, 47, said, adding that there was “no chance” of the coach slowing down before the crash. The second man was later taken to hospital for treatment, although the extent of his injuries have not been confirmed. IOPC regional director Jonathan Green said: “My thoughts are with the families and friends of the two people who have died, those injured and all those affected by this incident. “It is important that we now establish all of the circumstances surrounding this collision. The IOPC is investigating four deaths in separate incidents involving police vehicles, within four days of each other, in January. There were 29 police-related fatalities on the roads in 2017-18, of which 17 were “pursuit-related”, according to the IOPC. Eight involved police vehicles responding to emergency calls. Five deaths involved police vehicles hitting pedestrians while responding to an emergency call and one pedestrian death related to a pursuit. In the previous year, 2016-17, there were 32 fatalities on the roads involving the police. Of those, 28 related to pursuits and none involved police responding to emergency calls.